Globally, numerous pollution hotspots have been identified using satellite-based instruments. One of these hotspots is the prominent NO2 hotspot over the South African Highveld. The tropospheric NO2 column density of this area is comparable to that observed for central and northern Europe, eastern North America and south-east Asia. The most well-known pollution source in this area is a large array of coal-fired power stations. Upon closer inspection, long-term means of satellite observations also show a smaller area, approximately 100 km west of the Highveld hotspot, with a seemingly less substantial NO2 column density. This area correlates with the geographical location of the Johannesburg-Pretoria conurbation or megacity, one of the 40 largest metropolitan areas in the world. Ground-based measurements indicate that NO2 concentrations in the megacity have diurnal peaks in the early morning and late afternoon, which coincide with peak traffic hours and domestic combustion. During these times, NO2 concentrations in the megacity are higher than those in the Highveld hotspot. These diurnal NO2 peaks in the megacity have generally been overlooked by satellite observations because the satellites have fixed local overpass times that do not coincide with these peak periods. Consequently, the importance of NO2 over the megacity has been underestimated. We examined the diurnal cycles of NO2 ground-based measurements for the two areas - the megacity and the Highveld hotspot - and compared them with the satellite-based NO2 observations. Results show that the Highveld hotspot is accompanied by a second hotspot over the megacity, which is of significance for the more than 10 million people living in this megacity. Satellite-based instruments such as the Global Ozone Monitoring Experiment (GOME 1 & 2),1 the Scanning Imaging Absorption spectroMeter for Atmospheric CHartographY (SCIAMACHY)2 and the Ozone Monitoring Instrument (OMI)3 have been used to quantify trends of various atmospheric trace gas concentrations on a global scale.4 Of interest here are the observations of tropospheric nitrogen dioxide (NO2) column densities5,6,7,8 and the identification of global NO2 pollution hotspots.9,10 NO2 plays a key role as a precursor for tropospheric ozone (O3), aerosol nitrate (NO3-), and the hydroxyl radical (OH°). In Figure 1, an area smaller than the Highveld hotspot, with a less substantial NO2 column density, is seen to correspond with the geographical location of the megacity. Ground-based measurements conducted in this study indicate that satellite observations may underestimate the importance of this conurbation to local NOx pollution as a result of specific diurnal cycles of emissions. However, ground-based measurements cannot be compared directly to satellite-based column measurements because satellite measurements reflect on the total column, whereas ground-based measurements do not indicate the total column density. Nonetheless, the aim of this study was to evaluate the potential contribution of the megacity to the NO2 Highveld hotspot. 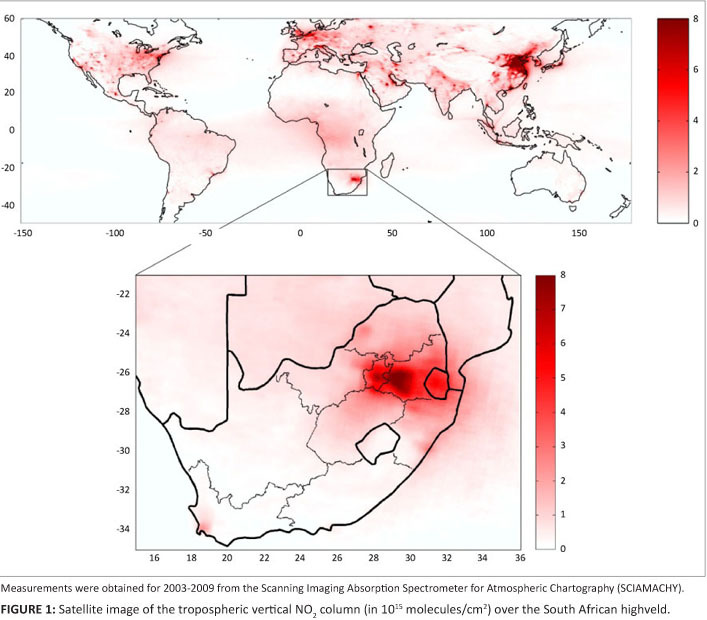 The diurnal cycles of ground-based measurements of NOx were evaluated for the megacity and the Highveld hotspot, and compared to satellite-based NO2 observations. From the spectral measurements of the satellite instruments, slant column densities (SCDs), that is, integrated concentrations along the effective light path, of NO2 were derived. The stratospheric slant column is subtracted from the total slant column, yielding the tropospheric slant column density (TSCD).7,8 For translation of the TSCD into a tropospheric vertical column density, tropospheric air mass factors (AMF) are generally needed. This translation requires prior assumptions on the ground albedo, as well as the vertical profiles of aerosols, clouds and NO2, which makes it the most uncertain step within satellite retrievals. To compare SCIAMACHY and OMI data sets meaningfully (including differences in viewing geometry, local time, ground pixel size and the AMF calculations), we (1) focused on TSCDs (which are far less uncertain than TVCDs) and (2) investigated relative patterns (i.e. ratios of TSCDs for the megacity versus the Highveld). This approach mostly eliminated potential systematic biases caused by the use of different satellite instruments and retrievals. 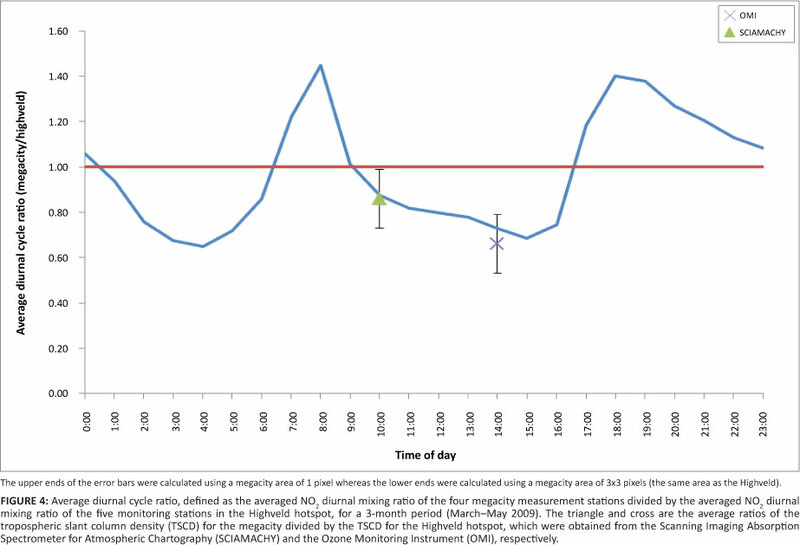 Hourly near-surface concentrations of NO2 were obtained from four air-quality monitoring stations within the megacity and at five stations in the Highveld hotspot for a period of 3 months in autumn 2009 (March to May). These stations were specifically chosen as their locations are regarded to be representative of the ambient concentrations of these areas. Figure 2 indicates the locations of these measurement stations within the megacity and the Highveld hotspot. These stations are operated in the megacity and the Highveld hotspot by the town council of Johannesburg and the industries, respectively. Apart from their strategic positioning, these stations also complied with the South African Air Quality Information System quality-control requirements. Data received were also manually checked to identify possible errors and outliers. Ground-based NO2 measurements were made with chemiluminescence instruments using molybdenum oxide converters. NO2 is catalytically converted to NO on a heated molybdenum surface and then measured as NO by means of chemiluminescence in the reaction with ozone. This method not only converts the NO2 to NO, but also partially converts other oxidised nitrogen compounds and can therefore cause overestimations of NO2 by between 17% and 30%.18 However, this technique is still widely applied and measurements with these instruments currently provide the only available near-surface data for the regions under discussion. Figure 3 shows the NO2 diurnal cycles for each of the ground-based stations in the megacity and the Highveld hotspot for the 3-month period. It is evident from Figure 3 that the NO2 mixing ratios of the megacity and the Highveld hotspot were mostly of the same order of magnitude. The megacity diurnal cycles were characteristic of urban areas dominated by traffic emissions, with maximum atmospheric NO2 levels during peak traffic periods in the early morning and late afternoon (Figure 3). In contrast, the NO2 diurnal cycles measured in the Highveld hotspot were less pronounced. This difference can be ascribed to the fact that the industrial activities that are mainly responsible for NO2 emissions operate 24 h per day. Measurement station H2, however, was an exception, as it showed a distinct diurnal cycle, presumably because it is relatively close to a city (Witbank) and is influenced by traffic emissions. 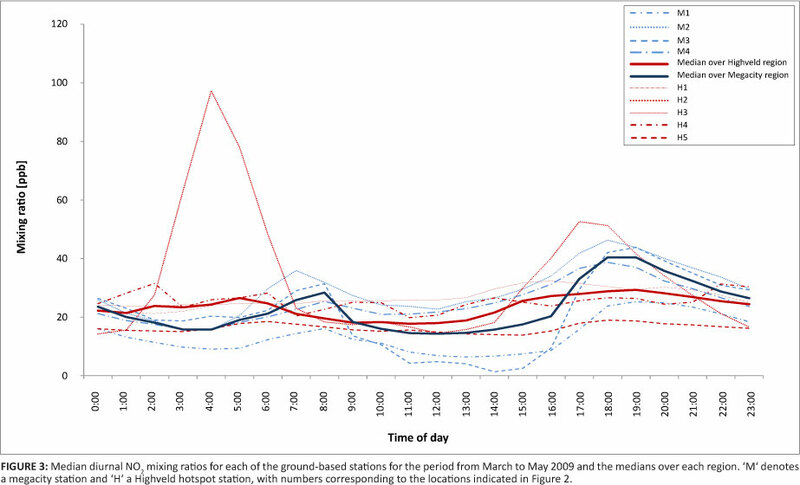 In order to facilitate the comparison of NO2 levels of the two areas, the ratio of the median concentration of the four megacity stations versus the median concentration of the five Highveld stations was computed, and is plotted in Figure 4 as a function of the time of day. Ratios greater than 1 indicate higher NO2 concentrations over the megacity than the Highveld, while ratios less than 1 signify higher NO2 concentrations over the Highveld than the megacity. From this average diurnal cycle ratio, it is apparent that there are two distinct periods: 06:00-09:00 and 17:00-21:00, when near-surface megacity NO2 mixing ratios are higher than those of the Highveld hotspot. These time periods coincide with peak traffic hours in the megacity. The ratios of the TSCD for the megacity divided by the TSCD for the Highveld hotspot are also shown in Figure 4, for measurements obtained from SCIAMACHY (2003-2009) and from OMI (2005-2009). The ratios were calculated from mean maps on a 0.35° x 0.35° grid. The actual numbers depend on the choice of the areas used for averaging. For the Highveld, an area of 3 x 3 pixels (i.e. =1°=1°) was selected that contained all H stations. For the megacity, two different areas were considered: (1) 1 pixel (containing all M stations) and (2) 3 x 3 pixels (the same area as the Highveld). The upper ends of the error bars reflect the first choice, the lower end the second choice and the cross and triangle the averages of each ratio. The ratios of the TSCDs could be biased if the AMFs for the Highveld and megacity were different. However, terrain height, aerosol load (MODIS aerosol optical density) and mean cloud fraction (from OMI) were similar for both regions. 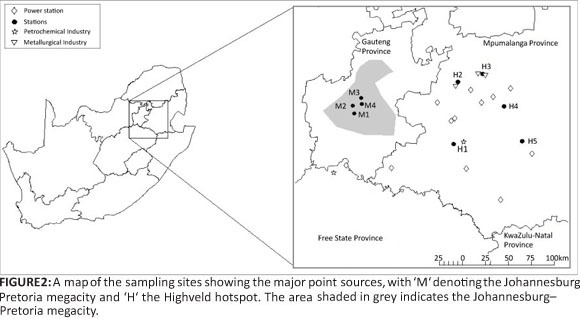 The satellite-observed NO2 TSCDs over the Highveld hotspot were generally higher than those over the megacity. The 24-h average ratio of the ground-based observations is close to one (0.90), indicating that, at ground level, the overall NO2 pollution levels in the megacity were comparable to those of the well-known Highveld hotspot. Although the geographical area covered by the Highveld hotspot is larger than the area of pollution in the megacity, this area of the megacity deserves more attention than it has received, because of the large urban population that is affected by the pollution. We have shown that the Highveld hotspot - well known in the international science community because of its prominence in satellite images - is accompanied by a second South African hotspot over the Johannesburg-Pretoria megacity, with peak NO2 levels exceeding the maximum daily Highveld values during the morning and evening traffic rush hours. This finding is of importance for the more than 10 million people living in this megacity. Although satellite instruments have been valuable in pointing out hotspots worldwide, we have shown here a limitation as a result of their specific overpass times. Satellite overpass times that coincide with the peak traffic hours of the megacity would be more ideal. However, early morning overpasses would not necessarily be more suitable for satellite detection, as a result of the trapping of pollutants near the surface where satellite measurements do not provide a suitable response. Early evening overpasses might be more feasible to detect gaseous concentrations because peak traffic emissions would be better mixed in the boundary layer by evening. Further progress on this issue will require more ground-based and aircraft profile measurements of the region. Direct observation of tropospheric NO2 vertical column densities with ground-based Multi AXis Differential Optical Absorption Spectroscopy (MAX-DOAS) measurements19 or airborne instruments may be particularly valuable. Airborne DOAS measurements can be used for direct observation of tropospheric NO2.20 A comprehensive study of the Highveld hotspot and the megacity is required in order to develop a better understanding of the true extent of the NO2 hotspot over the interior of South Africa. An improved understanding, as well as greater public and political awareness of this pollution hotspot will be valuable, especially in light of eventually determining the consequences of this additional hotspot for O3 production, impacts on health and agriculture, and effective mitigation measures. We acknowledge the use of the tropospheric NO2 column data from the OMI sensor; Sasol Technology Research and Development (South Africa) for additional financial support; the City of Johannesburg (Gideon Slabbert and Alfred Pheko) as well as Sasol and Eskom for the provision of ground-based data. This work also received funding from the European Union's Seventh Framework Programme (FP/2007-2011) within the project MEGAPOLI (grant agreement #212520). A.S.M.L. conducted this work as part of her PhD study and was therefore the main investigator; T.M.B., J.P.B. and P.G.v.Z. were study leaders; S.B. assisted with satellite data interpretation; M.G.L., G.D.F., J.J.P., T.W. and K.-P.H. made conceptual contributions.